The Royal School of Needlework has been producing their Essential Stitch Guide series in conjunction with Search Press for a couple years now. I’ve reviewed all the books in the series so far (Blackwork, Crewelwork, Silk Shading, Stumpwork, and Whitework). 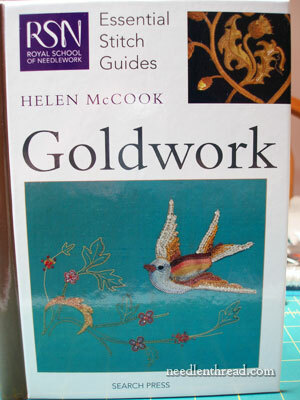 The most recent addition to the series is the Goldwork stitch guide, by Helen McCook. Here’s a glimpse of it and my impressions. I’ve been waiting for the goldwork stitch guide for a while! When the RSN first started their series of Essential Stitch Guides, goldwork was my first thought. So, as soon as I saw that the release date was coming up, I pre-ordered a copy so I could get my eager, grimy paws on it as quickly as possible. And, although I am exaggerating more than a little bit on those points, I will admit that I did build up quite a bit of anticipation for this book, which can always be a dangerous thing when you want to look at a book objectively. After the book arrived and I gave it a good once-over, I had to set it aside and come back to it for a twice-over, and then a thrice-over. Finally, I’m ready to write about it. Keep in mind that the Essential Stitch Guide series is a collection of small, accessible books that are meant to introduce embroiderers to specific types of needlework. Within the confines of the book size, the whole scope of the technique could never be covered. Instead, what we get in these stitch guides are the rudiments of the technique, enough to introduce and teach the basics. 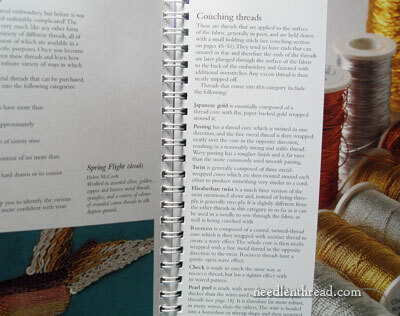 The stitch guides are not thorough, exhaustive books on the subjects they cover – they can’t be. And really, can any single book on any technique be? 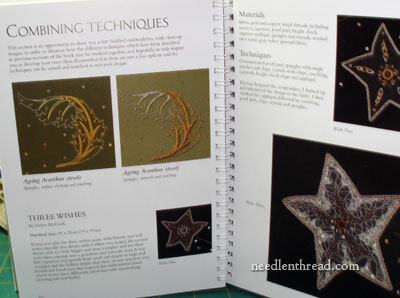 So, as introductory books, they form an excellent reference and guide for embroiderers. At the beginning of the goldwork stitch guide, we get the initial information that we find in the rest of the series: information on the RSN, an introduction to the topic, a short (and, in this case, quite limited) history of the topic. I was somewhat disappointed with the history section in this book, though again, we have to remember that the books are small and not meant to be exhaustive. The history of goldwork here is limited to goldwork in England – a bit of talk about the wealth of kings and the pomp of ecclesiastical ceremony, and then the involvement of the RSN in creating and maintaining significant goldwork embroideries. When reading the history part, try not to forget that goldwork in the West was taken to incredible heights in Belgium, in France, in Italy, in Spain; and further, we can’t really ignore the influence of the Far East on goldwork. Again, it’s a small book. But really, does our outlook have to be quite so small? 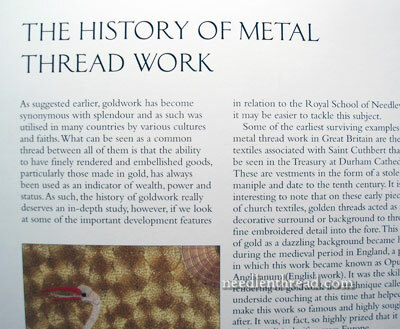 A little mention of other significant places where goldwork flourished would have at least broadened the perspective of those reading the history section. Granted, most folks don’t purchase a stitch guide or instructional book to read history – and so we move on to the meat of the matter, which is, of course, the rest of the book. Goldwork Threads: This is Worth It! The section on materials, and specifically on the threads used in goldwork, is worth the price of the book, even for just these few short pages of information. Why? Although many other goldwork books go into the types of metal threads used in goldwork, they don’t necessarily go into what the threads are composed of and how they’re made. This book does. It’s brief, but good information. This type of information can help the embroiderer determine how, or how not, to use specific threads and how to identify threads. Before instructing on actual methods, we learn how to frame up our ground fabric, a little bit about design and how to work up a design concept before beginning, some information on starting to stitch (how to thread a needle, starting the thread, the use of beeswax and the like), the order of work (an excellent section for the beginner! ), and a very nice section on the various types of padding. The instructional content in the goldwork stitch guide is delivered via step-by-step photos and photos of finished stitch samples. All aspects of basic goldwork are covered: couching threads (passing thread, Japanese gold, plunging the threads, couching in a circle, using pearl purl, etc. ); what the author calls “cutwork” (chip work – the use of purls and so forth); working with kid leather; s-ing; spangles; plate; embroidery stitches with gold threads (i.e. working chain stitch or fly stitch with cut purls); using color (diaper couching, or nué); and finally, combining techniques. You can get a very good idea of the instructional photos and other content by viewing this PDF from Search Press that offers some full-sized pages of the inside of the Goldwork Stitch Guide. It’s definitely worth looking at – you’ll see at least three good examples of goldwork pieces from the RSN collections used as illustrations, too. 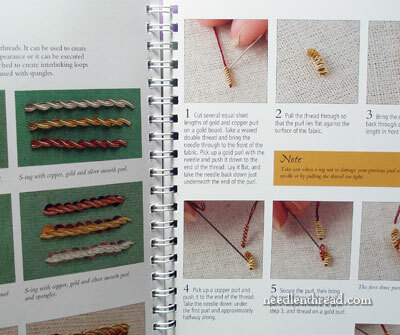 The final section on combining techniques is where you’ll find pictures of various projects worked by the author that will provide inspiration for your own goldwork. Keep in mind, this is not a project book, so you won’t actually find instructions for completing the projects shown here, but you will find details on the techniques used in each project, with clear photos so you can get an idea of how to incorporate the techniques into your own goldwork projects. The book ends with an index. 1. Truthfully, as far as the instruction goes, it’s all been done before. If you have the A-Z of Goldwork or Hazel Everett’s goldwork book, you aren’t going to find new instruction here, and the A-Z of Goldwork and Hazel Everett’s book are a bit more thorough, because they’re a bit larger and can fit more in. 2. I found the history part somewhat irksome. I do wish the book had at least glanced beyond the shores of England. 3. At just under $20 once the exchange rate is figured, it is somewhat expensive, especially if you already have the books mentioned in #1 above. However, it is likely that the price of the book will decrease a bit once it is available in your country. You won’t have the exchange rate and long-distance postage to worry about, anyway. 1. I really like the description of the threads in this book. 2. The instructional content is good, clear, and succinct – enough information to get the beginner started on the goldwork journey. 3. The book is small, easily portable, has a spiral binding for easy opening while working – it’s a nicely made book. 4. Of course, who wouldn’t love the pictures from the RSN collections? 6. It’s a worthwhile member of the series. It’s nice to have these reference books on each technique in one compact, matching series. In the US, RSN Goldwork is available here, through Amazon. Worldwide with free shipping, RSN Goldwork is available here, through Book Depository. i linked your blog to introduce to my readers this gorgeous tutorial! please let me know if it is ok to you! Must be a broken link because the post is about blanket stitch applique. Thanks for reviewing the RSN Goldwork book and sharing it with us, great review. Dear Mary I am as always so fascinated by your knowledge, so today I would like to ask you a question. On my “I would still like to do this list” goldwork is still a feature. I am so blessed to to visit your country again and we are leaving next week Wednesday. We will be visiting San Francisco and Las Vegas as well as my friend in Redding. As the stuff you need to do goldwork is not readily available in my country I was wondering whether you can give me a few pointers what to buy just to build up a general stash, things you would use in a simple piece. 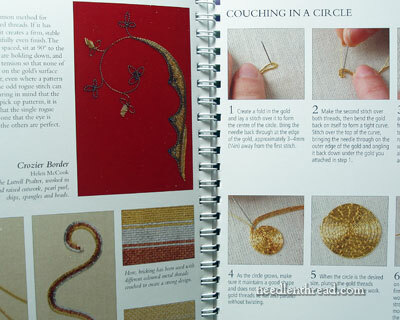 I can just mention that I do have Hazel Everett’s book on goldwork. Hi, Elza! What a great idea! Since you’ll be in California, you might order from Hedgehog Handworks and have them mailed to where you are staying? There are a couple needlework shops in the San Francisco area (definitely go to Needle in a Haystack in Alameda and Lacis in Berkeley! ), but none of them have a selection of goldwork threads. Hedgehog Handworks is located down by Los Angeles, which is quite a distance from San Francisco. If you drop me an e-mail with a photo of some kind of goldwork that catches your fancy, I could tell you what threads are in it, and maybe that would narrow down some choices? Thanks so much Mary for your reply. I do want to go to Needle in a Haystack and I have found a nice shop Stitcher’s Paradise affiliated to them in Las Vegas. 🙂 Oh the wonder if the internet. Laci’s sounds nice too. I think I going to shop till I drop or run out of money. Most likely it will be the latter, heh heh heh, I will never have this opportunity again 🙂 I also like the idea of ordering stuff from Hedgehog and have it delivered to my friend Roby in Redding. As you can imagine I am very excited and looking forward to this trip tremendously. Thank you for your suggestions. Like you, I would not be impressed with a book that says it is giving one a history of goldwork, then only gives a history of English goldwork, without mentioning what was going on in other countries at the same time. I have one or two RSN books and like them quite well. I also have a few A-Z books that a really like. I was wondering which one to get on goldwork, because goldwork seems to be a subject into itself as far as embroidery goes. When I took a class on Brazilian embroidery, I found that except for a few stitches, it uses mainly basic embroidery stitches. Thank you for reviewing these books for us, so we will know which ones to buy. They aren’t always available in a bookstore, where we can compare them side by side. All special threads need to be ordered by mail (or internet) so knowing the differences between them helps. Your reply to Elza is a reference I can use to get started. Next Next post: Thread Talk: Silk Gimp!